Building a context marketing team — Bonfire Inc.
One of the most common question sets we're asked is, 'what kind of skills do I need to hire for and what should my team look like?'. Evolving from a traditional marketing and technology org chart to a structure optimized for context marketing is neither simple or easy. There are material changes to organizational structure, culture, and business processes that occur at the same time completely new skills are learned. An optimized integrated context marketing team understands the skills of the rest of the team and how they all relate to organization's objectives & tactics. To follow are skill groupings and skill sets that align with Sitecore and context marketing. The groupings of experience design, system building and intelligence exploration align with the cyclical/iterative nature of context marketing; design it, build it, report on it, learn from it, repeat. Strategist - The strategist can get to an organization's strategic themes & objectives. They can articulate who the customer is and what their journey looks like. They can provide a roadmap for the wordsmith, marketer & designer to follow. They can spot market opportunities and can evaluate bright & shiny new technologies in the context of how they might apply to the organization. Wordsmith - The wordsmith works across all mediums; text, audio, video. They're adept at crafting messaging across channels that are in the context of the customer's profile and journey stage. They, along with the marketer & designer, bring the strategy to life. Marketer - The marketer knows the tactics that roll up to the strategies. They turn the knobs and flip the switches on the marketing systems that the organization uses. They understand the purpose of each system and how they interact together. Designer - The designer puts the visual on the wordsmith's message. They work with the strategist to help everyone visualize the plan. They bring the strategy to life. The system builder skill grouping is focused on technically designing and developing within all systems in the organization's tech stack. They all get, and apply helix principles. Front end developer - The front end developer knows HTML, CSS & JS. They have, or are building chops in their favorite front end framework (Angular, React, Vue, etc.). They understand MVC and how Sitecore renderings are developed. Back end developer - The back end developer works to extend functionality across tech stacks. They know the CMS functions of Sitecore very well (table stakes). They also work to grow their skills in xDB, xConnect, EXM, etc. Sitecore administrator - The Sitecore admin is similar to the back end developer in their knowledge of the Sitecore system. 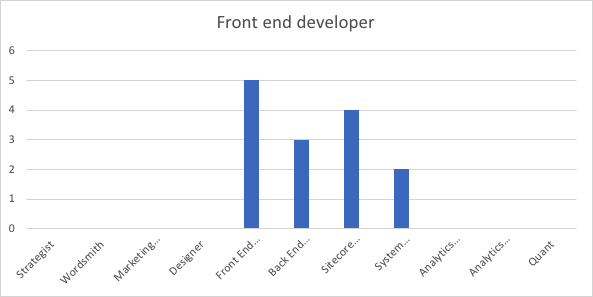 They're technical enough to work alongside the front end and back end developer. They also have the ability to liaise with wordsmiths, marketers & designers, helping them become more self sufficient. System integrator - The system integrator understands all the systems in the organization's tech stack, the data structures of each system and all APIs. They have an organizational data model in their minds and a solid understanding of xConnect. The intelligence explorer skill grouping is focused on accessing all the data points from all the systems in the tech system, turning it into knowledge & insights, and using them to build new experiences. Analytics reader - The analytics reader is a data wiz. They can take data from multiple systems and massage it into different formats. They create reports, use BI tools, handle ad-hoc data dumps, etc. In a lower maturity organization, this is configuring Sitecore analytics and alike. In a higher maturity organization, this may be adding a marketing data lake repository and a BI layer onto that. Analytics interpreter - The analytics interpreter can draw inference from the organization's analytics. They can relate that to strategy, and they can communicate that to leadership and the experience design team. Quant - The quant is an emerging skillset. The skills of data science and machine learning are going to become more important, as we move into the development of predictive customer experience models. 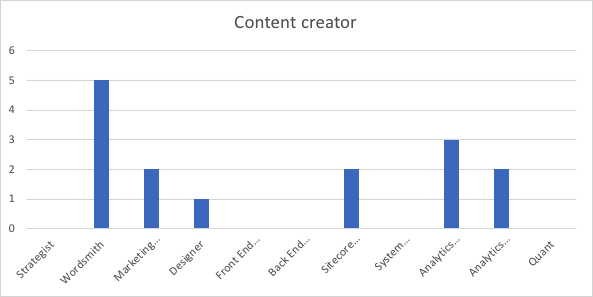 As Sitecore Cortex moves from future feature hype to reality, this skillset need will materialize. To get an understanding of where your organization is, you can create a 1-5 skill ranking for each member of the team. In many cases contractors or partners are included in the team. It's important to note that this ranking is not intended to be an industry peer ranking system. Meaning, you don't have to be a rockstar to be a 5. We're looking for skill rankings that are sufficient to cover the needs of the organization. 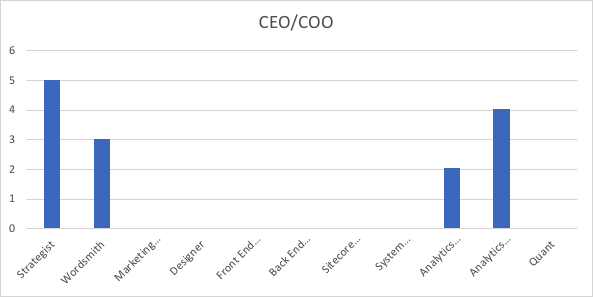 Below is a bit of a mashup of some titles within real world organizations, and the aggregate coverage across the context marketing skill spectrum. 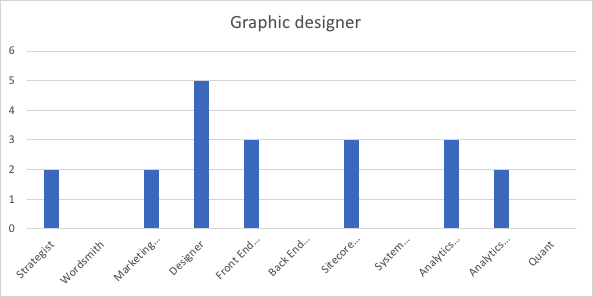 If you do something similar to this, you should have a good feel for where your skills are, where your gaps are and how much coverage is made up of internal team members vs. contractors.